This is the novel that, without realizing it, I always expected Genevieve Valentine to write. If you only paid attention to her debut novel, Mechanique, or if you only followed her short stories, The Girls at the Kingfisher Club may come across as a bit of a departure. But, readers who have followed Valentine on her blog cannot help but notice her passion and knowledge of fashion. From her red carpet rundowns to various commentary on much older fashion, this is something that Genevieve Valentine knows, cares about, and can discuss with wit and knowledge. Which is to say that The Girls at the Kingfisher Club takes a step away from the post apocalyptic steampunk circus of Mechanique and instead visits Prohibition era New York City with speakeasies and dance halls. The twelve Hamilton girls are shut in their father's house by a father who has never even met most of his daughters. He really wanted a son, you see. The world the novel is set in involves seriously old money New York, which is often a fairly quick turnoff for me. Please, tell me a story about the troubles of rich people. But, that isn't the story here. It is noted to provided context to the threat of the father marrying the girls off to get them out of the house, and to illustrate in what sort of world the father moves in. The story is of the twelve daughters who learn to dance on their own from watching the occasional movie at the cinema, and practicing together in their house when nobody else is around. Eventually, the oldest sisters sneak out of the house to find a place to go dancing. It is only out dancing, even with the risk of police raids, that the girls feel truly alive and at home. It is the only thing that is truly theirs. Given the situation at home, this shouldn't come as much of a surprise. Mixing in the excitement of dancing well, bootlegging, police raids, and the overall tension of escaping the wrath of an autocratic father, Genevieve Valentine has written an outstanding novel. As much as I enjoyed Mechanique and her short fiction, Valentine absolutely nailed it with The Girls at the Kingfisher Club. I mentioned in the first paragraph that this was the novel I always expected Valentine to write. I'll go one step farther, without realizing it, this is the novel I always wanted Genevieve Valentine to write. She stuck the landing with this one. Many professional reviews make mention of "The Twelve Dancing Princesses", from the Brothers Grimm, and how The Girls at the Kingfisher Club is a modern retelling of that fairy tale. One's familiarity with the original story may shape how the novel is read, but The Girls at the Kingfisher Club stands very well on its own. 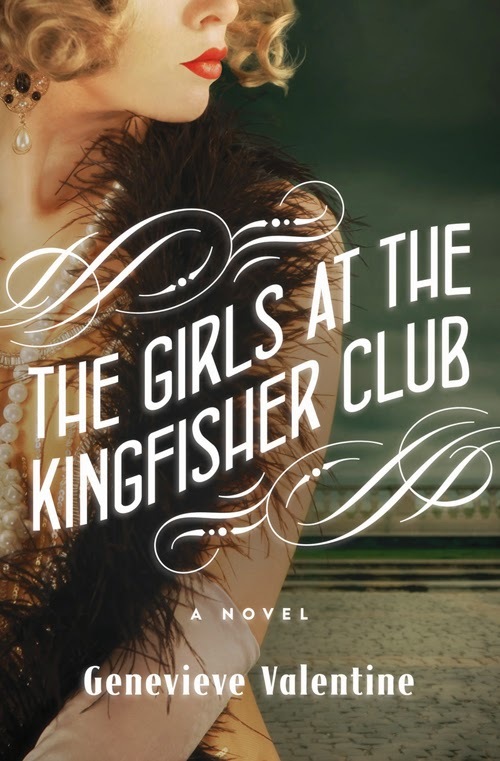 It may be part of a tradition of adapting older stories and setting them in a different era, sometimes modern, sometimes during the 1920's, buts The Girls at the Kingfisher Club brings its own elegance and its own excellence to the table. The Girls at the Kingfisher Club is a delight.